IDEODROME was conceived as an experiment on how video intercrosses with the various forms of art and with the work of individual artists who use this platform as a tool of artistic expression. The focus of the project is on the creation of short videos on a common subject, by artists who come from various backgrounds and disciplines and their presentation in various public spaces. IDEODROME is particularly focusing on how video and the digital technology of image and sound is explored through narrative and non-narrative forms, on its power to express and communicate complex meanings and on the effects of the democratisation of the recording media technology through its widespread and multi – functional uses in our contemporary era. IDEODROME is also interested on how video as a recording art interacts with the perfomance and representational arts, as well as with the public. It is a highly interdisciplinary project in which artists from various disciplines such as film-making, visual arts, animation, poetry, dance and theatre, co-operate to explore the potentials of the medium within the framework of a given theme. The theme of IDEODROME 2007 was Invisible Spaces. 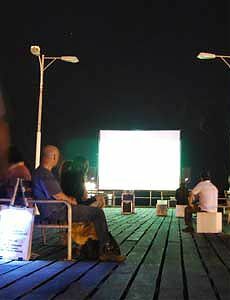 Seven video makers participated, producing seven short works which were presented on a large screen at the end of the pier of Limassol on the 5th of November 2007 in non-stop screenings between 5.00 and 11.00 p.m.
Konstantia Sofokleous, Ioakim Mylonas, Yiannis Colakides, Yiannos Economou, Helene Black, Nicos Synnos and Adonis Florides. 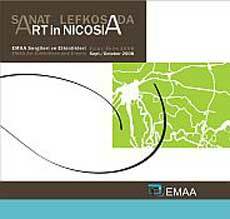 We would very much like you to watch these NeMe produced videos uploaded on Vimeo, presenting the following works: Nicos Synnos, Trip to the Moon 2, Helene Black, No place like home, Adonis Florides, Eyes, Ioakim Mylonas, Nostalgia, Yiannos Economou, Camera Travels, Konstantia Sofokleous, Cross Stitch Kit, and Yiannis Colakides, Letter from Eric. IDEODROME 2007 is a NeMe project initiated by Adonis Florides and presented by the IMCA. The event is sponsored by the Cultural Services of the Cyprus Ministry of Education and Culture , Limassol Municipality and the Co-operative Bank of Limassol. © 2007-2019 NeMe and/or respective contributors.